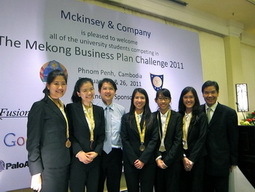 Business plan competitions bring education to the next level, so as McKinsey Mekong Business Plan Challenge. Students from leading universities from all the intra-mekong countries joined this event at the Raffles Hotel Le Royal, Phnom Penh on Feb. 25-27, 2011. Applying lessons and knowledge from all business perspectives, we had a chance to produce something closer to reality. Two teams from Thammasat University secured the places in the final round and got the opportunity, once again, to strengthen our presence and reassure the business community that we are the best business school in Thailand. As soon as we arrived at the competition, we encountered high expectation for Thammasat students. The school�s reputation and standard have already been established. And we did not disappoint the crowd. Two undergraduate teams obtained two medals from the competition. 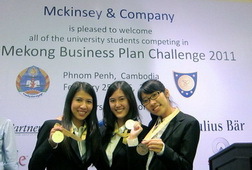 We also have to extend our appreciation to McKinsey & Company, the co-host of the competition, for providing their valuable human resources to train and prepare us for the final presentation, Ajarn James Fitzpatrick for letting us know about such eminent event, our friends and family for rooting for us, and last but not least, BBA Program for always giving us great opportunities. Posted date: March 29, 2011 � 14:40 hrs.